now supercharged with more ebooks and software. FreeToSell.com was The First Web Site selling an eBook package on the Internet. Today, we proudly offer you the First True Turnkey System that you can start selling right away. No experience needed! You don't even have to download or upload anything. Hard to believe? Read on Carefully! Let's take a look at the products first. 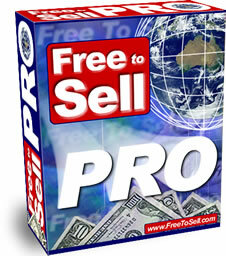 Your FreeToSell Pro package now includes 66 carefully selected top quality info products. Each of those comes with full resell rights or giveaway rights. This package is yours to keep, yours to use and yours to sell. You will not only have the hottest products of our time to sell but also have the most powerful information and tools for selling these products. Whether you are searching for the Best Learning Experience or the Best Earning Experience on the Internet, FreeToSell PRO gives you both. As we keep adding more items into the package to ensure your products are the most current and the best value on the Internet, you get Free Unlimited Upgrades. If you like to see the details of the package, click here. comes with a TRUE Turnkey System! Have you ever wanted a professionally designed web site just like this one so that you will be ready to make sales in no time? Now you've got one! You get this professionally designed web site with your FreeToSell PRO system! Don't even have to deliver the products. You will be Ready To Sell in Less Than Five Minutes! This package is the biggest on the Internet yet you don't even have to download it to resell it. Not at All! Our system handles the entire process for you. Should you need the products for your personal use, there is only One eBook that you need to download. It takes less than 2 minutes with a 56K connection. This Ultimate eBook allows you to download the rest of the products in the package and access the online eLibrary from inside of the master eBook at any time. on Your behalf with Your Name and Links! The FreeToSell Package also gives you the ability to Personalize the Master eBook with your name, Your Own Web site Link and your Affiliate IDs to many other quality Programs for free. You have probably heard about branded or personalized ebooks. There are ebooks offered with resell rights that you could brand your links into the book before you sell them. FreeToSell Pro has taken this process to the next level! We will deliver your personalized version of the FreeToSell Package to YOUR customers with YOUR personal links on your behalf! Yes, we have taken care of everything for you. There has never been a better time to resell this best eBook package on the Internet. There isn't a smarter way of getting such a huge package. There isn't a smarter way of Selling such a Huge Package to YOUR customers. If you would like to know exactly how the system works, please click here. I'm not going to use a Script to tell you that this offer is going to expire at Midnight of Tonight. You are smart enough to see through these kinds of tricks. The truth is that the earlier you start selling this package the better position you will achieve in the market place. Would you agree? It's your choice. It's your decision! I sincerely suggest that YOU Act Now. Will you enjoy selling this package as much as we do? Copyright © 2000 - by FreeToSell™ All Rights Reserved. FreeToSell™ is a Division of Hitech United Australia Pty. Ltd.